You are doing your regular cardios, cutting down your fatty foods and sweets intake. Despite all this, you still feel burnt out? Unable to drop those extra kilos? Don't have the energy to greet each day with enthusiasm? So what is that you are missing? Sleep deprivation inhibits one's ability to lose weight - even while exercising and eating right!! Yes, it's SLEEP that's missing in the puzzle. Sleep is essential as it is the time when our bodies replenish; repairing the mental and physical wear-and-tear we suffer during the day. However, our "24/7" culture has created a sleep-deprived generation. Cell phones, computers and television keep our brains stimulated resulting in fatigue, poor health and, not surprisingly, weight gain. Research shows that sleep regulates mood and is related to learning and memory functions. Not only will it help you perform well at work, but it is also a critical factor for your health, weight and energy level. Food is also related to sleep by appetite and metabolism. This link between appetite and sleep provides further evidence that sleep and obesity are linked. Sleep disorders occur for a variety of reasons. They can be caused by stress, medical problems and lifestyle changes. Caffeine: It is a natural chemical that activates the central nervous system, which means that it revs up nerves and thought processes. If you drink caffeinated drinks too close to bedtime, chances are it will keep you awake. Alcohol: Many people use alcohol to help them relax before bed, but the effect wear off and so they wake up in the middle of the night. Over time, alcohol-induced sleep becomes less restful, so sleeplessness will become a constant fact of life. I'm not saying you need to give up alcohol, but don't use it like a sleeping pill; and if you have insomnia, I strongly recommend omitting alcohol for a few weeks to see if your sleep problem resolves. Large meals close to bedtime: When you lie down and try to sleep after a heavy dinner, your digestion will slow down, make you feel uncomfortable, and possibly keep you awake. It is recommended to eat dinner at least three hours before bed. Exercise: A good workout can make you more alert, speed up your metabolism and energize you for the day ahead, but exercise right before bedtime can lead to a poor night's sleep. Thus properly timing exercise is necessary to maximize the beneficial effects. 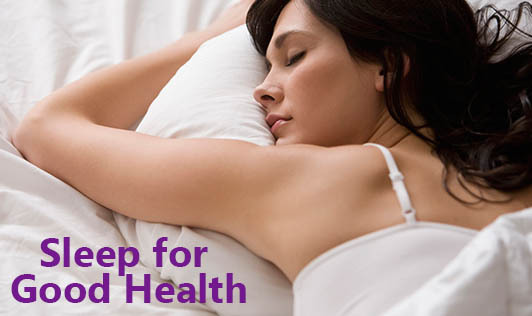 Sleep experts recommend exercising at least three hours before bedtime because body temperature is related to sleep. Body temperatures rise during exercise and it's important to allow it to cool off before sleep. Health is complex - if one part of the body suffers, you're likely to see consequences in other areas of your life. Though diet and exercise are critical components of healthy lifestyles, it's also important to remember that sleep is innately linked with our eating habits, our exercise routine and how we function on a daily basis. Getting proper amount of sleep each night is necessary to face the world with your best foot forward. Sleep, along with good eating habits & good fitness routine is the road to good health.